Corte Madera Volunteer Fire Department Ltd. self-funded and volunteered to build this fire station in Corte Madera in 1930, located at Willow Ave. and what was then 1st St., later renamed to Tamalpais Dr. It was later donated to the town of Corte Madera and today serves as the Town Hall. The current headquarters station is located one block east of this building, at Tamalpais and Pixley. It was built in 1966. Photo courtesy Corte Madera Volunteer Fire Department Ltd. Archives. 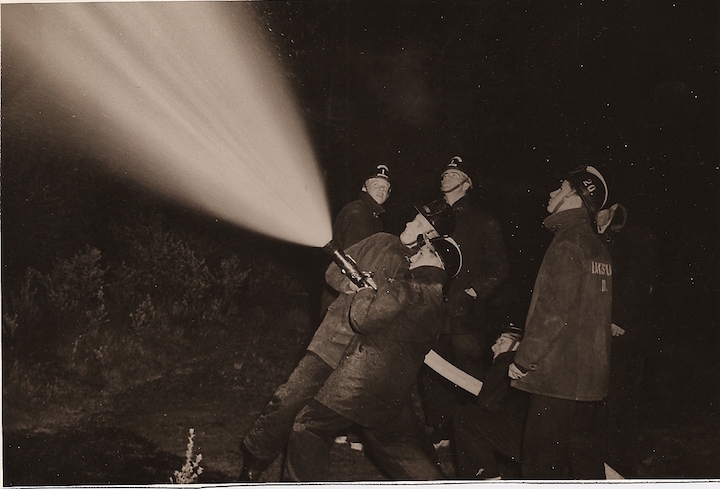 Larkspur volunteer firefighters practicing operation of a 2.5-inch fire attack hose line in 1960, during an evening training session. Photo courtesy Larkspur Volunteer Fire Foundation Historical Museum. Yes! I have Marin Fire History Information, Photos, or other assets to share! Or, I have a question for the group. ​Or, I'd like to be included on a mailing list for updates.